The Russian-Chinese Strategic Partnership is about to take on an ecological angle with Moscow’s suggestion of piping Altai mountain river water to the drought-stricken deserts of Xinjiang. Aside from obviously being used to unburden the Chinese from dealing with the catastrophic effects of climate change, the proposed fresh water pipeline will also have a premier strategic purpose as well. The research begins by examining the strategic vision at play with this initiative and then explaining how it relates to Color Revolutions. Finally, the insight that’s revealed from investigating the prior two topics will be linked to the forthcoming global struggle for reliable freshwater supplies in forecasting how the US will try to disrupt Russian-Chinese water cooperation in the coming decades. Xinjiang is the global intersection point for most of China’s Eurasian Silk Road projects, and it’s thus of the highest importance that the frontier region remains stable and prosperous in order to function as the ultimate juncture of the 21st century’s transcontinental infrastructure projects. While foreign-supported terrorism and the proselytization of violent ideologies are certainly a challenge in the area, what most directly affects the population’s sympathies towards the central government are more immediate concerns such as their standard of living. The countless material products that are expected to pass through the region and tangentially enrich it can only do so much in improving one’s livelihood if there are potentially pressing problems with water availability to the local citizens. At this moment in time, the Chinese government has been doing a phenomenal job ensuring that the people of Xinjiang are taken care of by providing for all of their needs, but Beijing is also keen enough to plan ahead several decades in advance in order to preempt as many forthcoming challenges as possible. Considering the recent drought and unpredictable global climactic changes, China has legitimate fears that the current environmental difficulties could be exacerbated in the future. Needing to keep Xinjiang as stable and prosperous as possible in order to facilitate its grander goals of pan-Eurasian integration through the New Silk Road, China and Russia came up with the idea of using Kazakhstan to geographically facilitate the transfer of mountain river water from Altai Krai to Xinjiang’s deserts. If successfully completed, then the ambitious project would guarantee Xinjiang a stable supply of freshwater and counteract the physical-political effects of any future droughts, thus depriving the US of one of the potential avenues through which it could one day try to stir up anti-government unrest. For example, the authorities would not have to worry about their citizens being manipulated into protesting against a shortfall in domestic water availability (sewage and in-house running water complications), a dearth of drinking water, and/or the disastrous agricultural and livestock impact of drought because each of these scenarios would be rendered increasingly unlikely after Xinjiang reliably connects its water infrastructure to Altai’s. 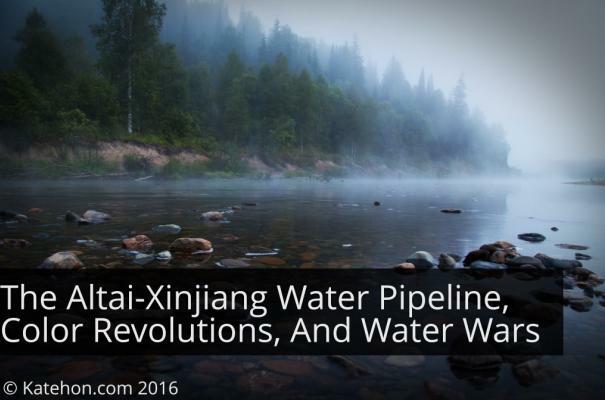 From another angle, however, the establishment of the Altai-Xinjiang water pipeline would increase the chance that the US would try to stage a Color Revolution scenario in Altai in order to interfere with the vital source of western China’s water supplies. Even prior to the project’s completion, the US and its army of NGOs will expectedly stage disturbances aimed at highlighting the “environmental consequences” of the initiative, potentially even encouraging its local “activists” to enter into clashes with the police. Should the pipeline get up and running, then the authorities need to be on the lookout for potential signs of growing identity separateness between the local Altai population and Moscow. While it’s always a positive development when indigenous cultures embrace their uniqueness and are proud of their heritage, there’s a distinct line between peaceful celebration and hostile antagonism. If the locals organize around some distinct facet of their identity — perhaps a revival of the Shamanistic religion of “Burkhanism” or a violent interpretation of Tibetan Buddhism — then they could more easily be herded into nationalist groups that might thenceforth be directed to stage aggressive anti-government protests. The fusion of identity separateness and a US-promoted awareness of the Altai’s newfound geostrategic importance to multipolar affairs could be enough to encourage increasingly radicalized individuals to agitate for substantially enhanced autonomy or outright independence, being misled by Washington and its NGO minions into thinking that they could indefinitely sustain their ‘sovereignty’ solely through profitable water exports to China. The proposal to connect Russia’s freshwater resources with the growing Chinese consumer base is emblematic of Moscow’s rising role as the world’s premier water superpower. No other country has as much freshwater reserves as Russia does, which thus increases is global profile and will soon allow it to reap enormous strategic advantages as the rest of the world literally thirsts for this resource. Russia’s other advantage — though regularly spun by the West as a disadvantage — is that the Siberian and Far East regions where the freshwater originates are largely underpopulated and accordingly more than capable of diverting their own supplies abroad without any consequences at home. In the future, Russia might not only come to be China’s main energy partner, but also its vital lifeline to clean freshwater reserves as well, thereby making itself forever irreplaceable as Beijing’s most important grand strategic ally. Because of the pivotal role that Russia is expected to play in providing clean drinking water to some of China’s over one billion citizens, the US will undoubtedly conspire to find a way to interfere with the reliable shipment of this life-sustaining resource and thus gain leverage over both of these Great Powers. In a sense, this is merely an adapted application of what it’s already trying to do vis-a-vis global energy flows, albeit much more directly connected to life-or-death ends. Using the techniques of Hybrid War that it’s been perfecting over the past decade and especially in the most recent years, it’s foreseeable that the US will try to instigate identity tension inside the freshwater-originating regions or transit areas. Looking at the map, a fair share of Russia’s major Siberian and Far Eastern rivers either start or pass through autonomous republics (Sakha/Yakutia, Buryatia, Tuva, Khassia, Altai) or areas with a distinct identity separateness such as Altai Krai. Conclusively, it’s reasonable to suggest that the US might try to capitalize off of the indigenous population’s Turkic Buddhist-Shamanist identity in fomenting identity tension, with this scenario spiking in probability if Washington ever succeeds in swaying the Mongolian government over to the New Cold War side of unipolarity. The idea of linking Siberia’s freshwater supplies with China’s deserts, and presumably later on even to its major population centers, is an ambitious proposal that carries with it profound global significance. The world’s dwindling freshwater reserves are being pushed beyond their limit in providing nourishment to an ever-increasing population, to say nothing of their use in agriculture, hydroelectricity, and animal husbandry. In the coming decades, the countries that control freshwater resources either in whole or in part (whether through their source, transit, or mouth) will be in a superb position to influence all of those around them. Even though China is unquestionably the freshwater king of East, Southeast, and South Asia through the sources that it controls in Tibet (which explains the US and India’s unceasing struggle to destabilize and dislodge the region from Beijing), its unchecked industrialization of the past couple of decades has led to unprecedented pollution that has made some of these supplies dangerous and unfit to use. Moreover, not all of the country is served by the Tibetan rivers, with the geostrategic trans-continental juncture point of Xinjiang being absolutely arid and deprived of any significant water resources. This part of China is also the scene of foreign-supported terrorist aggression, and it’s in the best interests of Beijing to do everything that it can to secure the locals’ contentment with the central government in order to avoid losing “hearts and minds” amidst this partially ideological conflict. What Russia’s planning to do isn’t just to provide Xinjiang with Altai freshwater supplies, but possibly even to expand this cooperation further in connecting northeastern and eastern China to similarly reliable and clean resources. This would greatly relieve the Chinese authorities of future contingency planning in the face of an ever-unpredictable climate and could also free up its own domestic resources for further export and strategic utilization as regards the downstream countries. By remedying China’s freshwater shortage amidst its never-ending population growth, Russia would fulfill an irreplaceable role in Beijing’s grand strategic calculus and thereby maximize its importance to its critical multipolar partner. However, it’s due to this very same vision of pragmatic win-win cooperation between the two Eurasian Great Powers that the US has a vested interest in sabotaging their prospective freshwater trading network, which is why it might seek to capitalize off of identity separateness in Russia’s Turkic Buddhist-Shamanistic regions in one day stoking a series of meticulously preplanned Hybrid Wars designed to offset this eventuality. Though there presently aren’t any overt signs that the US has made any progress in actualizing this objective, it must still be astutely monitored by the Russian authorities in order to ensure that NGOs and other disruptive proxy actors don’t succeed in fanning the flames of conflict and disturbing the peace in this historically stable corner of the world.